Each of us has someone - if we're lucky, several someones -- we look up to. It could be a personal hero or role model -- a person who, by his or her own example, has been as an inspiration, a driving force in our life. Our relationship to them may be very personal. They could be parent, teacher or close friend. For others, there may be no relationship at all. A hero could be a historical figure, a distant relative, a modern-day celebrity or a fictional character from a book. Whoever they are -- real or imaginary, from the past or the present --something about the way they live their lives has touched us in a way no one else can. 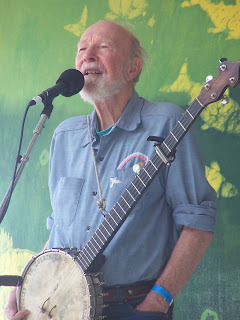 This summer I was in close proximity to one of my personal heroes, Pete Seeger. A folksinging legend of world renown, Seeger's persona is as closely interwoven with social, environmental, political and labor concerns as it is to his music. In mid-June, my husband, daughter and I traveled to Croton-on-Hudson, N.Y.,to attend the Clearwater Festival, a celebration Seeger initiated more than 30years ago to raise public awareness about the sorry state of the Hudson River. In the 1960s, the Hudson was a mess. Ripe with raw sewage, toxic chemicals and garbage, the river was unfit for human use. Dead fish littered its shores. Seeger, who lives with his wife, Toshi, in a riverside town, was determined to make a difference. In 1966, he joined forces with a small group of friends and neighbors to build the Clearwater, a replica of a 19th century cargo boat that once traveled the river. It was Seeger's hope that the beautiful wooden sloop would attract attention and help raise community awareness of the Hudson's problems. It did. Today treated water from the river is drinkable and fish once again swim in its depths. Much of the river's recovery is attributed to the efforts of Seeger and a dedicated team of supporters. A few years after the Clearwater was built,Seeger launched a music festival on the shores of the Hudson to further the cause. This year's festival drew more than 15,000 people who came to enjoy song, dance and a wide range of educational programs. Some, like me, came to get an up-close view of the man behind the movement. At 88, Pete Seeger, is as much the beacon of hope and inspiration today as he was in his earlier years. Although his voice is weaker than it was 30 years ago, that hasn't stopped him from singing. He still goes onstage to share songs with the audience, encouraging them, as always, to sing along "in harmony." During the festival, when he wasn't performing, Seeger mixed with the crowd, cordially chatting and shaking hands with those who approached him and standing in line alongside festival volunteers at the meal tent. I got my moment on Saturday afternoon when Ralph and I found ourselves unexpectedly seated next to Seeger and his wife for our midday repast. I was literally rubbing elbows with my hero. It's an odd feeling to suddenly be physically close to a stranger who has been so important in your life. Ralph encouraged me to take advantage of the moment. "Tell him how much he means to you," he urged. But I was suddenly struck shy. I didn't need to talk to Seeger to feel fulfilled. It was enough simply being in his presence. By watching him do everyday things like eating a meal and chatting with his wife, I felt as if I had already gained a small insight into the man behind the legend. Seeger was just a person, a regular person, eating lunch. No different than you or me, yet so much more. Through his music and longstanding mission to live harmoniously with nature and all of humankind, Seeger has influenced many. Songs such as "If I Had a Hammer," "Where Have All the Flowers Gone?" and "Little Boxes" have become apart of our cultural heritage. His tune "Waist Deep in the Big Muddy" found its way into dictionaries as a slang reference to the Vietnam War while, to this day, oppressed people around the world sing the hauntingly beautiful "We Shall Overcome." Despite his age, Seeger has a voice that continues to resonate with passionate concern for the environment, the Earth and all creatures that live on it. There is something about the simple lyrics he sings with such gentle strength of conviction that never fails to move me. I find his relentless optimism inspirational. His steady faith in the essential goodness of people always lifts my spirit when daily events do their best to bring it down. All too often, we wait until people die to sing their praises. I don't want to do that with this man who has meant more to me than any stranger I know. Though I was too shy at the Clearwater Festival to tell him so, I had much to say. So here's to you, Pete Seeger: Thank you for showing me how one person can make a difference. It's a lesson I live daily and believe in wholeheartedly. I remain ever grateful for having learned how something as simple as a song can change the way people seethe world and for realizing, by your example, that harmony is not just a way of singing. It's a way of living. A beautifully written article. I too have spent time with Pete and I agree he is just a person and yet he is so much more. I actually have recorded his song "Waist Deep in the Big Muddy" and I present a program called "The Works of Pete Seeger." I try to spread Pete's messages about the environment, civil rights and other social issues.